The featured attraction at a press conference at Logan Airport today will be a robotic vehicle designed to disarm car and truck bombs. But the remarks by US Representative Niki Tsongas and others probably will focus on two soldiers who were killed in conflicts on the other side of the globe. The purchase of the LandShark Series D robot, manufactured by Black-I Robotics in Tyngsborough, was funded by a congressional earmark sponsored by Tsongas, a Democrat from Lowell. 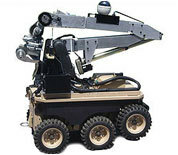 The robot, to be unveiled this morning, will be used by the State Police Logan bomb squad to fight domestic terrorism. Black-I Robotics, which created the robot, was founded by brothers Brian and Richard Hart after Brian’s son, Private First Class John D. Hart, was killed in a roadside attack in Iraq in 2003. In today’s ceremony, Logan’s new, unmanned ground vehicle will be dedicated to Lieutenant Derek Hines, who was killed in Afghanistan in 2005. Hines’s father, Steve Hines, is a lieutenant with the State Police who is stationed at Logan. A week before he died, John Hart told his parents that he was concerned that he and his fellow soldiers lacked body and vehicle armor. After John Hart and his commanding officer were killed in an unarmored Humvee, Brian Hart worked with Senator Edward Kennedy to procure additional funds for better body armor and more armored vehicles for soldiers in Iraq. Hart then cofounded Black-I Robotics, to employ robotic technology to help protect troops from improvised explosive devices. Unlike iRobot Corp. of Bedford and Foster-Miller of Waltham, much larger and better-known robotics firms, Black-I works primarily with off-the-shelf technology to reduce costs and increase flexibility and speed to market. The LandShark Series D, for example, is powered by three heavy-duty car batteries and driven by a pair of high-powered electric hybrid motors. It is designed to be a moving platform for a variety of technologies such as sniper-detection sonar, bomb detectors, and minesweeping gear. The basic version of the robot costs between $60,000 and $100,000, according to Black-I Robotics vice president Robert Hughes. Brian Hart said that Logan’s new robot is an advanced prototype designed to be used by law enforcement to fight terror threats in airports and other nonmilitary targets. State Police Sergeant Brian Moran, who commands the bomb squad at Logan, said the robot will increase his squad’s ability to investigate and disarm explosives from a distance. 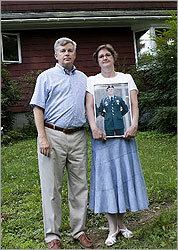 “Derek died protecting our country,’’ he said. Hart added that Derek Hines and his son were members of the same brigade, the 173d Airborne. Has increased airport security affected your desire to fly? Check out these creations that look - and act - like humans.